As you know, any time is a great time to go to Confession, but the Season of Lent is a particularly fitting time to examine your conscience, reevaluate the choices you have made, repent of your sins, and resolve to love God with all your being and to follow Him wholeheartedly. If you would like to go to Confession, here are some upcoming opportunities to receive the Sacrament of Reconciliation. Note: The Confession opportunities below are in addition to each parish's regular Confession times which are usually on Saturday afternoons. Confession might be a scary thing for some people. It's often a scary thing for me! In fact, driving to the church, examining my conscience, waiting in line--just about everything before I make the Sign of the Cross and start unloading my sins--are all quite unpleasant, to say the least! Yet, I can think of few sweeter words to hear in the entire world than, "...I absolve you from your sins in the Name of the Father, and of the Son, and of the Holy Spirit." 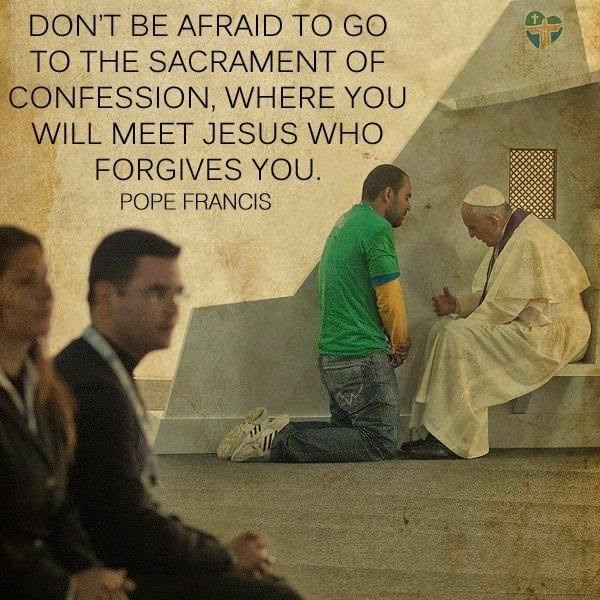 So, do not be afraid to go to confession! At his General Audience on February 19, 2014, Pope Francis said, "Everyone say to himself: 'When was the last time I went to confession?' And if it has been a long time, don't lose another day! Go, the priest will be good. And Jesus, [will be] there...He will receive you with so much love! Be courageous, and go to Confession!"